George is tired of being scruffy, so he decides to update his image, and soon he’s the smartest giant in town. That is until he runs into some animals who desperately need his help. Being a kind giant, George donates his clothes, one piece at a time, to the animals in need. 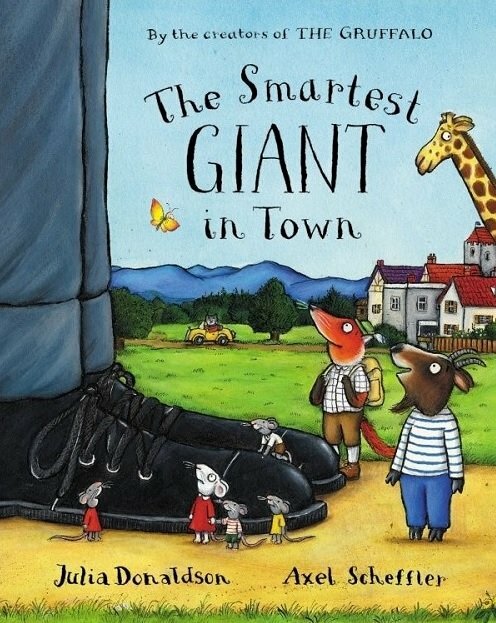 The Smartest Giant in Town is another fantastic picture book by Julia Donaldson and Axel Scheffler. It teaches children about empathy, kindness, and generosity through its engaging storyline and illustrations. Children love joining in with the cumulative rhyme in the story - and learning the rhyme also helps them to sequence the story events - bonus! The book is packed full of descriptive vocabulary, such as ‘long warm scarf’ and ‘big squelchy bog.' I also like using the illustrations in this book to teach the concepts of short and tall (as it can be quite hard to find books for these words). Multiple grammar goals can be targeted in this book, but it’s especially useful for possessive nouns (giant’s shirt, giraffe’s neck, goat’s boat, etc. ), as well as masculine pronouns (he, his). For further speech and language targets in The Smartest Giant in Town, see the list below.